Dreamkiller takes gamers inside the world of dark and twisted nightmares. Gamers will take on the role of Alice Drake, a psychologist with the extraordinary ability to enter the minds of her patients and combat the ravenous foes haunting their dreams. Utilizing a host of fantastic weapons and her own special abilities, Alice confronts our common demons only to discover an even deeper menace reigns within. The ultimate showdown becomes inevitable between that which would torment and she who will protect, and only one force will prevail amidst a variety of dreamscapes as varied and bizarre as the human mind itself. 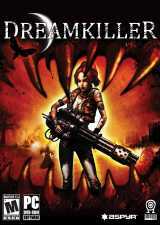 Dreamkiller features 12 rich levels of single-player gameplay each laced with swarms of hideous and disturbing enemies reflecting the mind’s infinite palette of fear. The onslaught continues with numerous multiplayer modes and a host of over-the-top weapons and supernatural abilities.